As the annual office holiday party creeps closer, business owners need to find ways to make their employees feel appreciated. Giving away personalized products and other knickknacks can be a great way to boost morale during end-of-the-year bashes, but you also have to be wary about certain party choices that could put a damper on the night’s fun. If you’re worried that your holiday party might be verging on the side of boring and bland, check out these five party fouls you’ll want to avoid for a soiree that will recharge your employees’ batteries for the upcoming year. This can seem like a straightforward issue, but a lack of food at a holiday office party – especially one where alcohol is present – can be the start of a bad series of events. With nothing to eat, employees are liable to drink more, and with less food in their stomachs to absorb all the alcohol, the potential for injury or inappropriate actions is much higher. Partner with a catering company or local restaurant to provide plenty of finger foods and substantial meals, or create a detailed list of which employees are supposed to bring what. 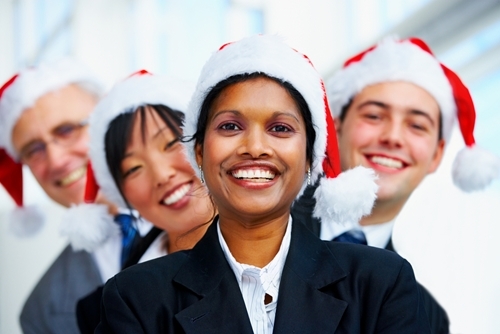 If your small business is small in name only, the annual holiday party is a great opportunity for employees from different departments to get to know one another better. However, the Puget Sound Business Journal explained that most people will just hang around with the colleagues they normally interact with at work. It’s your job as the owner and host to get people to connect with others they don’t normally talk to around the office – this will foster a stronger sense of commonality within your business. Glassdoor explained that some employees tend to think of holiday parties as chances to let loose and forget their inhibitions. While this is all well and good and can even lead to significant bonding between team members, Glassdoor related the story of Peggy Sanchez, an office worker who was showing off on a Segway motor vehicle that happened to be at her office’s holiday party. A combination of too much to drink and no one to stop her lead to a crash that damaged the Segway to the tune of $2,000. No employee walks into a holiday party expecting to receive a new car or flat-screen TV from the company as an end-of-the-year gift, but that doesn’t mean you’re off the hook to deliver some killer presents. Show your employees you care about them and their work with personalized products like Myron’s Custom Exercise Mat or Personalized Roll-Up Picnic Blanket. Emblazon these with each employee’s name or initials for a truly memorable gift. If you’ve done everything right, your holiday party will be a massive success. However, Alive Network explained that the day after might be even more important. After a night of drinking and dancing, your employees will likely be a little rough around the edges when they show up for work. Consider offering a nutritious breakfast to help your employees shake out the cobwebs or hire a local coffeeshop to provide some much-needed caffeine in the morning. Odds are that local businesses will be happy to get the exposure and you might even get a cross-promotional partner out of the deal.